As I explained a couple days ago, I am now devoting 365 posts on GotBaddog to bringing more awareness to Rheumatoid Autoimmune Disease (RAD) and the Rheumatoid Patient Foundation. It was Tanya’s idea, so it was only natural that I seek her opinion on terminology and phrases that are common in the community. She is a big fan of a blog called RAWarrior, and she read that people in my position should be classified as an RAD Caregiver. I accepted the moniker, but to be honest, I am not really fond of it. “Caregiver” gives the impression that I am here as a nurse which is definitely not the case. I prefer being her Lovegiver as that is much closer to the truth. Sometimes being a love giver is easy and sometimes I may have to work at it. I used to have a very nice Krups espresso cappuccino maker. I owned it for several years and it helped me provide some of the best morning brews this side of the Mississippi River. Sometimes, Tanya experiences pain levels that make it difficult for her to concentrate on things or even remember why she opened the refrigerator door. My Krups became a victim of RAD soon after Tanya moved in. As I mentioned earlier, Tanya was having a tough time with her pain levels. A couple of times she prepared herself a latte and forgot to turn off the steaming function when she was done. Soon the diaphragm between the water holding tanks in the unit developed a leak and my coffeemaker was no more. To her credit, she did attempt to replace it, but they do not make them any more and the one she found on eBay was broken. 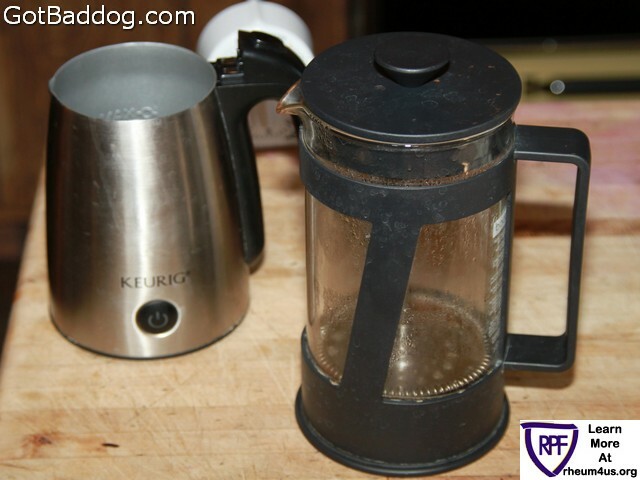 As a result we are now using the French Press pictured above; it is not even close to being the same thing. Oh well, I guess cutting down on caffeine is not entirely bad.